At the end the 19th century during peak of the Gilded Age, there was rapid economic growth through the expansion of industry. With more disposable income and accessible travel options, wealthy Americans acquired a fascination with the exotic and esoteric. 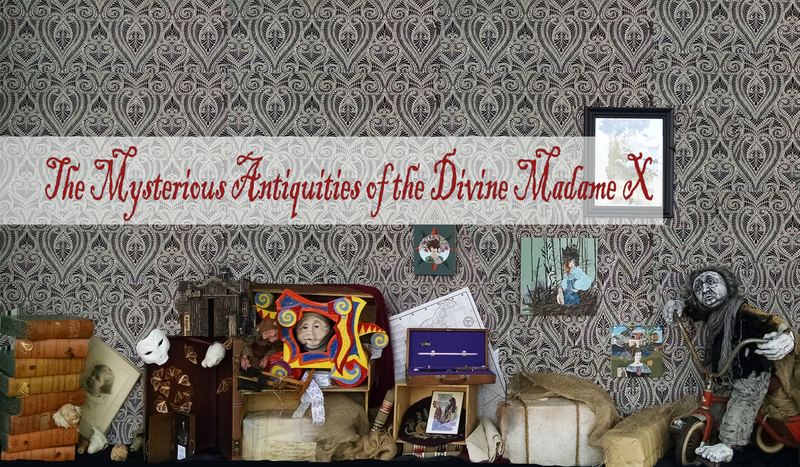 One of the most famous collectors of the time was the Divine Madame X. During her lifetime, she circumnavigated the globe with her husband Admiral D.S. Cooperfield, searching for artifacts, ornaments, motifs, and various obscure treasures of the time. After her husband’s death, Madame X retreated into solitude. With no children of her own, the entire fortune was bequeathed to her niece—her only known living heir. Upon inheritance of her reclusive great-aunt's estate, this generous local benefactor (who wishes to remain anonymous) discovered a secret room in the back of the house' attic filled with decades of items collected over an eccentric lifetime. We have been lucky enough to be able to present this discovery to you here, seen by the public for the very first time. This month’s guest curator features the talent of Judith Klausner. Judith is well-known for her close attention to detail using Victorian handicraft processes, transforming everyday objects into extraordinary objects of exquisite delicacy. Fascinated by the disregarded ephemera of life, she continues to ask the question what defines these things as ephemeral at all. It is this unique personal aesthetic and keen point of view that has been the inspiration for the latest installation at the Inside-OUT gallery.